This is a Bill being fast-tracked in the House of Commons, with all its substantive stages taken in a single sitting on one day. It is expected to also be fast-tracked in the House of Lords. and the Bill passed (by a majority of 5), its second reading, after 1 hour 6 minutes of debate. 14 “Remain” Tory rebels voted in favour of passing the second reading. The Committee Stage of the Bill began immediately following the result of the vote on the Second Reading. They are amendment 13, amendment 20, amendment 21, Government amendment 22, amendment 1, clause 1 stand part, amendment 14, amendment 6, clause 2 stand part, new clause 4, new clause 5, new clause 7 and Government new clause 13. Votes on amendments to the Bill started at 9:54 pm after 2 hours 34 minutes of debate. 14 “Remain” Tory rebels voted in favour of passing the Third reading. The Bill, as amended, passed the Third Reading by a majority of 1. The Bill has been sent to the House of Lords. The document presents the following conclusions for consideration by members of the House of Lords during their deliberations. As the result of a Government amendment in the House of Commons, the process by which a statutory instrument to alter ‘exit day’ in the European Union (Withdrawal) Act 2018 is changed from the affirmative to the negative procedure. The justification for this change, accepted by the Bill’s sponsor and the Official Opposition, was that it might be necessary to legislate as a matter of urgency to change the date of exit and that the requirement to get the approval of both Houses to an affirmative instrument could cause undesirable delay, risking a situation in which exit day in domestic law was not aligned with the exit day agreed under EU law. A House of Lords Library Briefing covers the House of Commons stages of the European Union (Withdrawal) (No. 5) Bill, prepared for Members of the House of Lords in the event that the bill is considered in the House of Lords on 4 April 2019. Andrea Leadsom today announced that parliament’s week-long recess in February has been cancelled. The House will know that recess dates are always announced subject to the progress of business. In this unique session of Parliament and in light of the significant decisions taken by the House this week, it is only right that I give the House notice that there are currently no plans to bring forward a motion to agree dates for the February recess and that the House may therefore need to continue to sit to make progress on the key business before the House. Dominic Raab gave a statement to Parliament on the publication of the White Paper on Legislating for the Withdrawal Agreement between the UK and the EU. This Government is committed to delivering a smooth and orderly Brexit. That’s why we’ve already passed the EU (Withdrawal) Act through Parliament, so we are ensuring our statute book functions after exit, whatever the outcome of the negotiations. I am grateful to the House, and the other place, for the many hours of scrutiny devoted to that vital piece of legislation. We are now embarking on the next step in the process of delivering that smooth Brexit for the people and businesses of this country. Mr Speaker, since June last year, the UK has been negotiating with the EU to decide on the terms of our withdrawal. We have made substantial progress: protecting the rights of EU citizens in the UK and UK citizens in the EU, deciding on the terms of the financial settlement, agreeing a strictly time-limited implementation period. Most of the Withdrawal Agreement, according to the EU side, around 80%, has now been agreed with our EU partners, and we have isolated outstanding issues for further focused negotiation. I will be meeting Michel Barnier again on Thursday, to take forward these negotiations at this critical time. And that is why, last November, we announced our intention to bring forward a new piece of primary legislation to implement the Withdrawal Agreement in UK law. So today, we are publishing a White Paper setting out our proposals for this important legislation, which will be introduced once the negotiations have concluded and Parliament has approved the final deal. 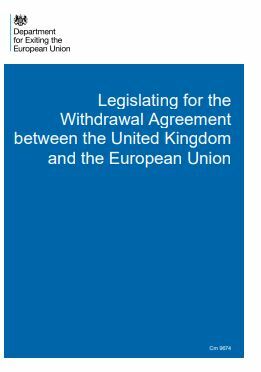 The White Paper on Legislating for the Withdrawal Agreement between the United Kingdom and the European Union sets out how the Government will implement the final Withdrawal Agreement we reach with the EU in UK law.